The space diagram, velocity vector diagram and the acceleration vector diagram are the important tools for analyzing a mechanism. With the help of the following example, i will explain the steps required to draw a typical velocity vector diagram. 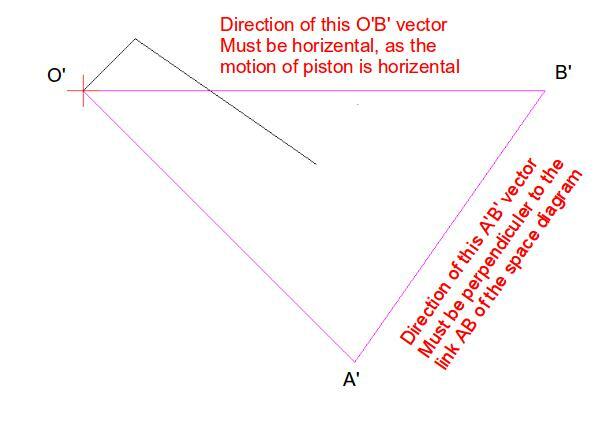 Upon completion of the velocity vector diagram, we will be able to analyze the four bar link to find out the absolute velocity of the piston B as well as the relative velocity of the piston B with respect to the joint A.
Step-1: Draw the space diagram: The space diagram is the “scaled” representation of the mechanism at the desired orientation of the links. We will use 0.1 scale factor here. 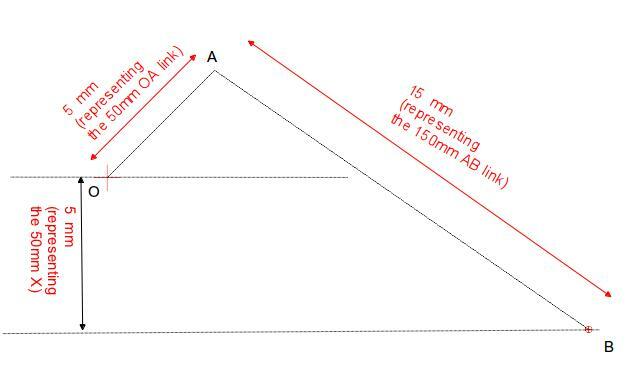 So, the link OA will be represented by a 5 mm line starting from the point O at an angle of 45 degree (because theta=45 degree in our case) with horizontal. At the end of the first step, you should get a line like OA (as shown above). Step-2: Space diagram continued: Next draw the link AB starting from the point A of the already drawn line OA in such a way that the length of AB= 15 mm (remember we took a scale factor of 0.1mm). 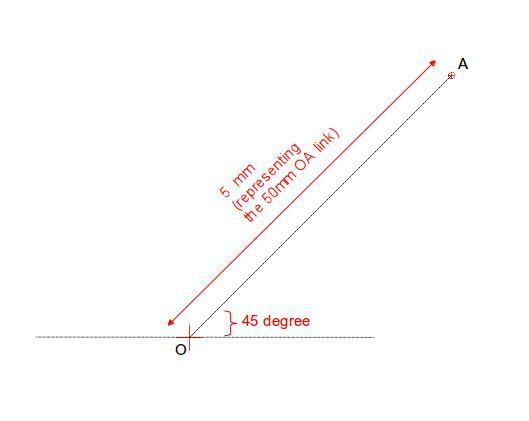 Also ensure that the distance between the two horizontal lines passing from the points O and B respectively is 5 mm (because X=50 mm and scale factor=0.1). 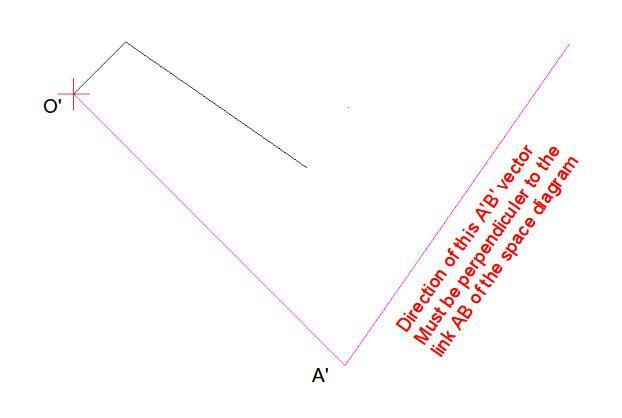 At the end of the step-2, you will get a space diagram consisting of the two lines OA and AB as shown above. We also know the length of OA=50 mm. Step-4: Start drawing the velocity vector diagram: The linear velocity of the joint A will be perpendicular to the link OA and will start from the point O of the space diagram we have already drawn. We will use a scale factor of 0.001 for drawing the velocity vector. 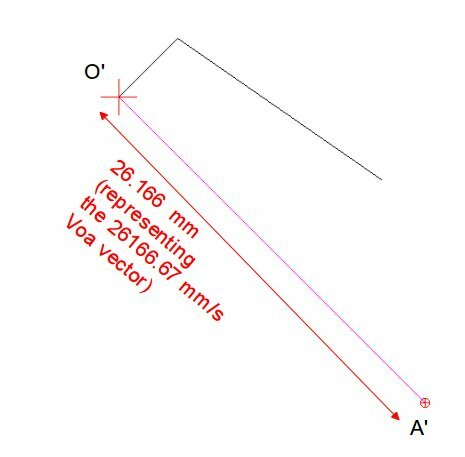 Hence, a line of length 26.166 mm and perpendicular to the line OA of space diagram will represent the velocity vector Voa of value 26166.67 mm/s. After finishing the Step-4, you should get the velocity vector O’A’ as shown above. Please observe the space diagram in the black colored line and velocity vector diagram in magenta colored line. 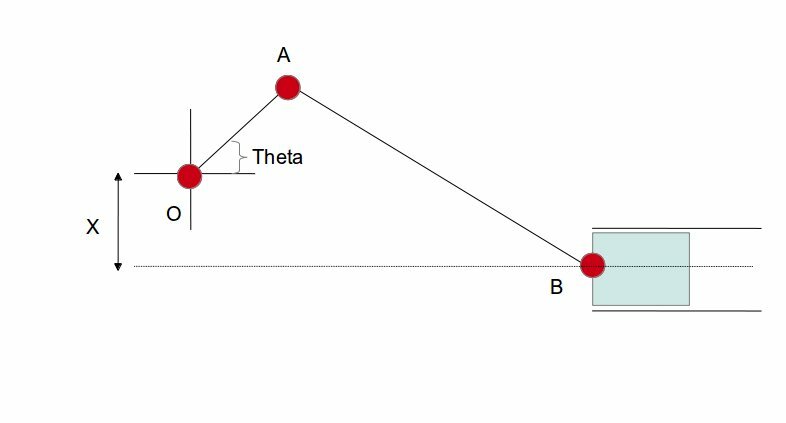 We know two things about the velocity vector (we will represent it by A’B’), one, it will start from the point A’ of the velocity vector diagram and it will be perpendicular to the orientation of the link AB of the space diagram. The thing we don’t know about the A’B’ is its value (or the linear velocity of the joint B with respect to the joint A). Step-7: Calculate the unknown velocity values: Now if we measure the length of the line A’B’ and factored the value with the scale factor (0.001 in our case) , we will get the linear velocity of the joint B with respect to the joint A. We are getting the length of the line A’B’ as 28.5878 mm. So for getting the velocity value of the joint B with respect to the joint A we have to divide it by the scale factor 0.001 and viola! We got the velocity value as 28587.8 mm/s. 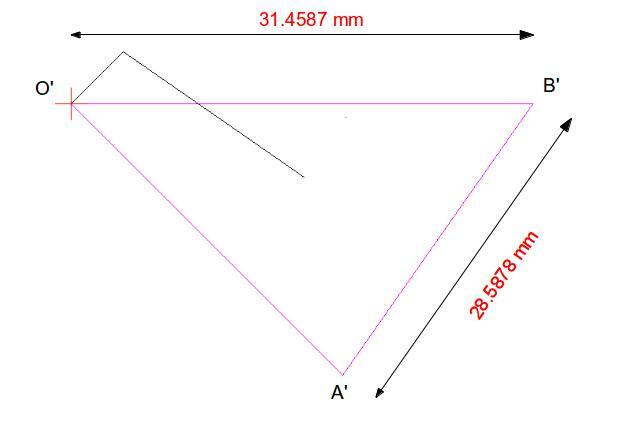 Similarly we got the velocity of the piston (joint B) of the four bar linkage mechanism with respect to ground (or the joint O) as 31.4587/0.001 = 31458.7 mm/s. easy expain thanks mech guru.